It's that time of year again. 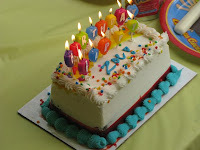 We weren't planning on having a party for Z but did anyway. It was on the 28th (coincidentally her due date), and thankfully we had a great turnout even though having a party during the winter break is a risky endeavor. The last thing you'd want to do is scar a child for life by throwing a party where no one came. The cake was an ice cream cake from Baskin-Robbins. Classic was the way to go - chocolate cake and vanilla ice cream. 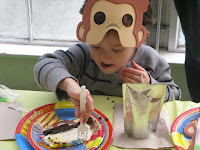 I try to stay away from themed or branded birthdays, but I couldn't resist getting some Curious George paper goods and masks in lieu of hats. Really, she did like it. 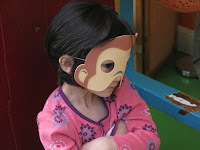 Our current favorite nighttime reading material includes "Curious George Learns the Alphabet". And what's a birthday post without some cake eating?